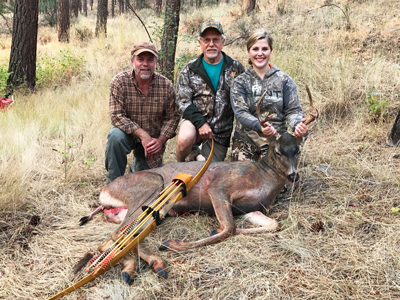 Growing up as one of four daughters in a family dedicated to traditional longbows, I have been shooting a bow since I was able to pull one back and have been an avid hunter since age thirteen. 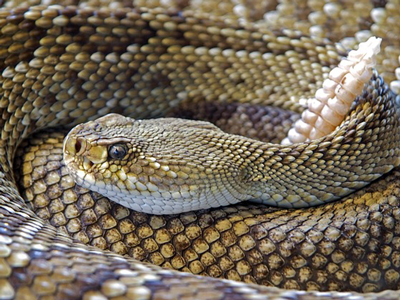 Most thirteen-year-old girls spent their fall weekends with friends at football games, but I spent mine hunting. My passion for hunting has come from the many generations of outdoorsmen in my family with the knowledge and devotion to teach their children. I have been immensely blessed learning everything I know from my father, Kenny Schneider, and grandfather, Ken Schneider. All of this knowledge has been passed down generation to generation. The first step was to dovetail splice the two billets together. My great-grandfather, Ron Schneider, grew up at a time when hunting was specifically meant to provide food for his family. With little income from the mink farm that he owned, he could not afford to purchase weapons, but this was not an obstacle for him. Being a craftsman, he resorted to making longbows. Later on, he made a few laminated recurves. He was instrumental in starting the Chinook Bowmen Archery Club and hunted the first designated archery hunting area in Washington state during the early 1950s. He then taught my grandfather about this endeavor. My grandfather has built more weapons than I can count. 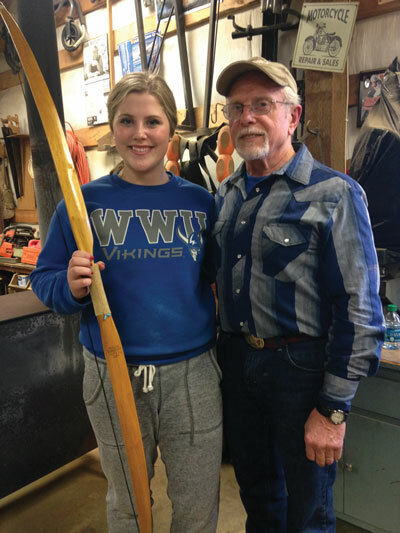 He visited Glenn St. Charles’ shop and museum many times in Seattle and spent an afternoon in Glenn’s shop learning how to boil the end of a self bow to make recurves. My grandfather is an amazingly patient, focused, and honorable man who has harvested many animals with the traditional longbows he has crafted, and he has been an inspiration to me. He also taught my father how to make bows and kept this family tradition alive. My father shot his first deer at age ten with a longbow. I have loved watching his hunting adventures throughout my life, and he has taught me many valuable lessons when it comes to pursuing animals. He also hunts specifically to provide food for our family. I have always been encouraged to utilize every bit of every animal I harvest and consider the antlers just a luxurious bonus. Many people who hunt today get lost in the idea of trophy animals, but I think that it is very important to remember that harvesting an animal is a blessing and a way to feed our families. This mentality is a traditional way of viewing the hunt, and I am thankful to have this point of view passed down from my father. 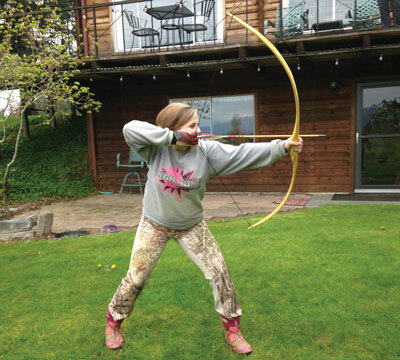 When I think about traditional ways of hunting, shooting a longbow is the first that comes to mind. 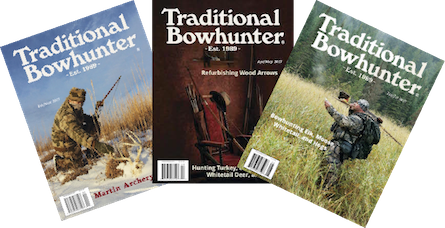 Although I have hunted with a rifle in the past, I have also watched many family members hunt with traditional bows. This past year I decided that I would like to begin archery hunting. 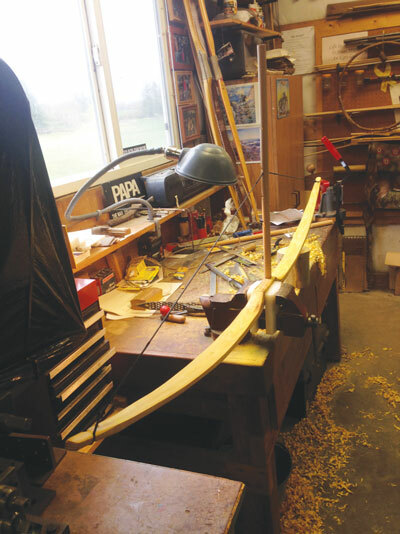 I contemplated which bow of my father’s or grandfather’s I wanted to use, until I came to the conclusion that I wanted to handcraft my own traditional longbow. I wanted the feeling of pulling back a beautifully crafted weapon I’d built by myself. I wanted to feel the powerful, overwhelming, indescribable emotions of harvesting an animal in the traditional way that all the older generations in my family have enjoyed. 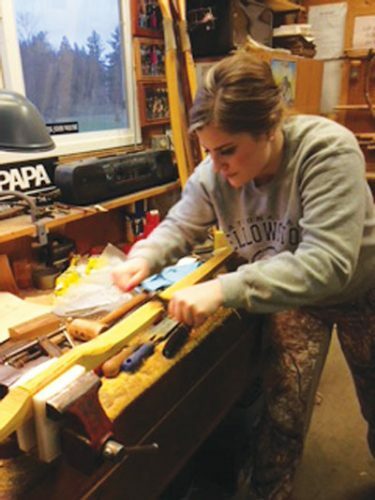 After I made this exciting decision to be a fourth generation bow maker, the planning began. I discussed this decision with my father, and we immediately began to pursue this desire and search for perfect billets of Osage orange wood. Living in yew wood country, choosing Osage was a difficult decision. Since that wood takes up to four years to dry and Osage offers unmatched durability, we decided to go with billets of dried Osage orange. This longbow was going to be used often and brought along on many adventures, so it needed to be strong. After receiving some beautiful pieces of wood, I brought them to my grandfather’s house and he began the teaching process. 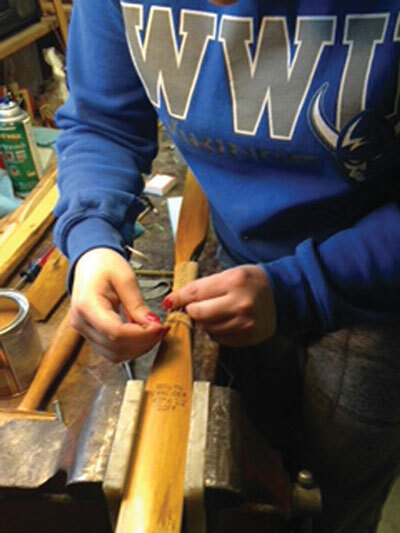 The author working down a single ring of wood on her new bow. This first aspect of creating this bow was the decision to splice together two adjacent pieces. I then picked out those with the thickest grain by looking at the end of the billets. The grains alternated from soft to hard, and I had to shave each billet down to the exact same grain. It is very important to stay in the same grain on the whole back side of the bow because this is the side that takes most of the stress. If any piece of the exterior is not in the same grain it can compromise the strength of the bow and be vulnerable to breaking when being drawn. After getting to that point, we began laying out the design on each half. Needing the halves to be as identical as possible, we measured every piece and angle the same. Using a string, ruler, and pencil, we were able to determine a centerline and shape for the bow. After cutting out the shape of each half, we began splicing the two halves together, drawing out the zig-zag pattern on each piece and cutting it out on a bandsaw. We connected the halves with glue and a small setback for extra strength and bend and then let it set overnight. Once the glue set, we added dowels for strength and smoothed out the handle. The next step was to sand, shape, and file the bow. This stage was fun, because my project was beginning to look more like a longbow. After many days using files and a spokeshave, we began shearing off wood from the belly of the bow to get closer to the desired poundage. Our goal was to get the draw weight to 40-45 pounds at my draw length of twenty-two inches. I filed nocks into the tips of the bow and put a string on it. Using a tillering stick, we were then able to see the bend of the bow and the symmetry of each side. We went back and forth, shaving off wood on each limb and standing back to look at the bend. During this process, it was very important to look down the end of the bow often to ensure straightness throughout. As we continued this process we began to get a nice even bend, and the bow was getting closer to the desired strength. We would check the pull-back using a scale until we reached our goal at forty-two pounds. Now that we had the bow where we wanted it, it was time to focus on the esthetics. We made an arrow rest, shaped the handle to fit my hand perfectly, and rounded the tips. I spent a lot of time smoothing and sanding the bow. At this point it was time to take the first shot with handmade cedar shaft arrows. I was overwhelmed with happiness getting to this point, but we weren’t done yet. We decided to add antler overlays to the limb tips. We glued them on and shaved them to fit for added strength and durability. The next step was to varnish the bow. I put on three layers of Spar Varnish and used a flat finish, so I would have no issue of sun glare while hunting. 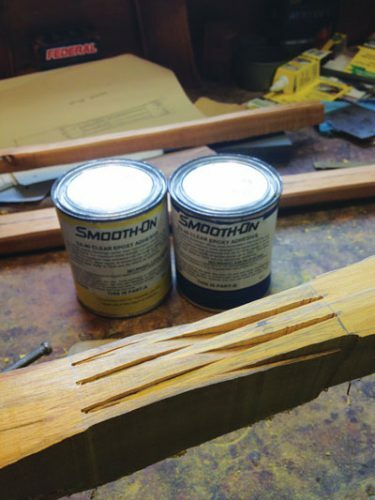 After the varnish dried, we put leather on the handle with contact cement to ensure a comfortable grip. I stitched the leather together so that it was strongly attached to my bow and handmade a string with beaver fur silencers. At this point, I had a beautifully crafted traditional longbow ready to shoot. The author testing out her new selfbow that she built with her grandfather walking her through the process. With deer hunting season approaching, it was time to practice. I dedicated myself to shooting my bow every day that I could to ensure accuracy. Knowing that bowhunting was extremely difficult, I had no expectation of harvesting an animal during my first year shooting my new longbow. Once the season opened, I headed to my father’s house in Twisp, Washington. We hunted hard during archery deer season, and I was blessed to be able to harvest a beautiful mule deer. I felt so accomplished being able to share this wonderful and successful experience with my father and grandfather. Their knowledge and support led me to this moment. 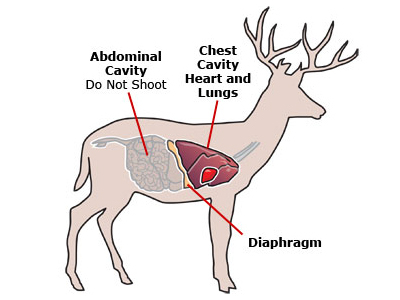 After harvesting a deer with my longbow, it was very important to care for the animal with my usual routine. As my father has taught me, I did my best to utilize every part of the deer. I started by hanging the meat for one week. The best way we have found to hang meat is in an old refrigerator. We put it in the shop with the shelves taken out and eye bolts in the top to hang the quarters and backstraps. This is a great way to chill and age meat in warm weather. We generally eat the tenderloins fresh and utilize the rest of the deer by grinding it into burger. The quality of meat cared for this way is very high. After hanging the meat, I processed and wrapped it. 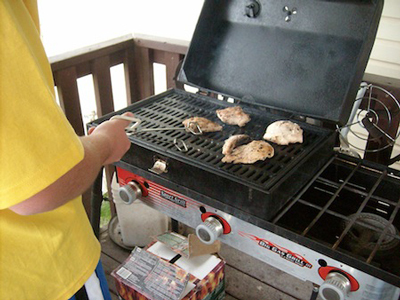 A tradition of our family is to cook a backstrap whole on a barbecue, a fun and delicious tradition. I value learning new ways to cook and care for the meat I harvest. The hide from the mule deer has been brain tanned, and I have begun making it into a skirt. I saved the sinew for projects and gave the bones to my dog. It is satisfying to know that every bit of the animal I hunted was utilized. It meant the world to me to share all of these valuable memories and moments with my family. Getting to experience the joys of making a longbow and having a successful hunt with it were special. Few people get the chance to learn and follow family traditions like this. I value the knowledge and hard work put into bow making. Knowing that my great-grandfather began making longbows to feed his family was my main motivation to take this journey. I cannot wait to teach generations to come about making traditional longbows and preserve this family tradition. 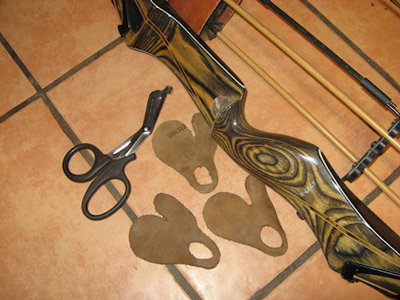 After shaping the basic form of the new bow, tillering was in order. 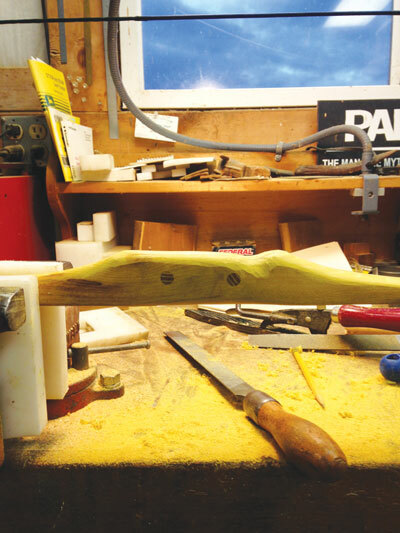 The handle of her new bow taking shape in the shop. As the final step, the author laces up a leather handle cover. With her new selfbow, the author took this mule deer buck. With her are her father, Kenny Schneider, and grandfather, Ken Schneider. Roslyn Schneider is a 21-year-old dental assistant who lives in Sumas, Washington, where she enjoys outdoor adventures.